The Shanghai Auto Show will do without booth pros this year. Here's why. Car News China reports (in this somewhat pervy article here) that the show won't have models whatsoever. The edict comes in the midst of a push by the Chinese government for puritanical decency in popular media, including chastising a popular TV show for airing too much cleavage. 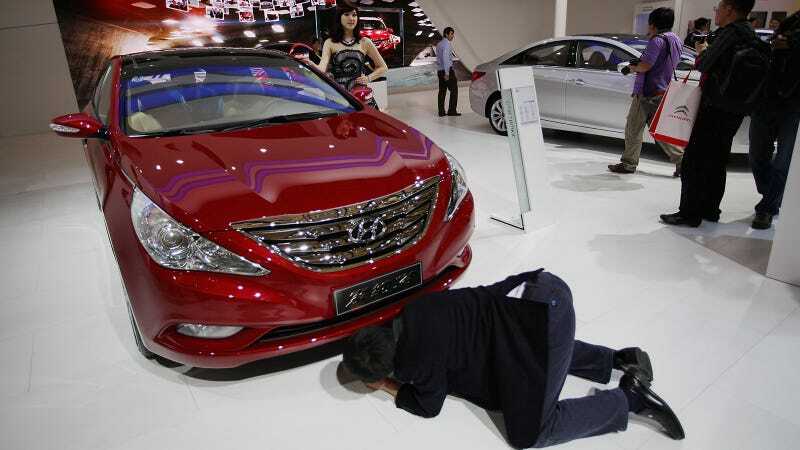 The Beijing has a history of condemning auto show models particularly when they got straight up naked back in 2012. Here's a statement from the Shanghai Auto Show organizers on the ban. Companies should focus on product quality and technology. Auto shows are supposed to give audiences an enjoyment of art. We hope exhibitors promote their products in a healthy and classy way. Activities with low taste and those that violate social morality are prohibited. While I'm not a fan of government pressure about "social morality," I do like the idea of giving up the '60s idea of models helping sell cars, even though the modern booth professional is far from just eye candy. We'll see if this catches on, or if old fat autojournos will continue to drool over legs lined up on auto show stands.